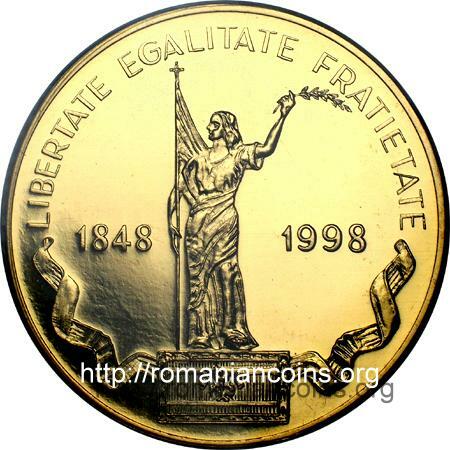 This coin belongs to a set of two golden pieces dedicated to the 150th anniversary of the Romanian Revolution of 1848, set that also comprises the value of 500 lei, likewise golden. The coins were engraved by Vasile Gabor. The first gold coin, of 500 lei, has a mass of 8.64 grams, value that apparently does not tell us anything. Because the coin was made in gold of 90% fineness, each coin contains 8.64 x 0.9 = 7.776 grams of fine gold, meaning exactly 1/4 of a Troy ounce. 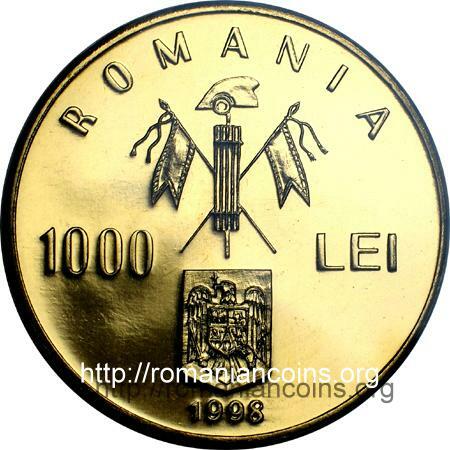 By comparing the 500 lei coin to the 1000 lei coin in the same set dedicated to the 150th Anniversary of the Romanian Revolution of 1848, the later weighing 31.103 grams of gold of 99.9% fineness, we discover that the mass ratio in fine gold is 1/4, while the face value ratio is 1/2 = 500/1000. Both coins in the set use images taken from Rosenthal's paintings. Rosenthal was born at Budapest, in a Jewish merchant family. He studied at Vienna and Paris. He moved to Bucharest in 1842, where he worked as portrayer. In 1848 he actively participated to the Revolution, being rewarded by the government with the Walachian citizenship (at that time only Christians could be citizens; an unchristian - like Rosenthal who belonged to the Jewish religion - could become citizen only by making important services for the country). In 1851 he was arrested by the Austrians for owning manifestos and for revolutionary propaganda as well. Several days after his apprehension, Rosenthal was found dead in his prison cell (in Budapest). "Revolutionary Romania" was painted at Paris in 1850. The model for Romania was Maria Rosetti (1819 - 1893). Romania was represented as a peasant woman, wearing embroided blouse and gold coins necklace. The woman protects the tricolor flag of the Revolution, and she stands ready to defend the flag - her right hand holding a dagger. It is an allusion to the battle of Dealul Spirii between the firemen company commanded by captain Pavel Zăgănescu and the Turkish troops that came to occupy Bucharest. The battle took place on 13th of September 1848. Maria Rosetti was the wife of the Romanian politician C.A. Rosetti (1816 - 1885), himself an important actor into the Revolution of 1848. Her maiden name was Grant. Mary was the daughter of Edward Grant from Guernsey. Her mother was French. Mary came at Bucharest as teacher - she was the sister of Effingham Grant, who in his turn came to Walachia as secretary of the British consul at Bucharest, sir Robert Gilmour Colquhoun (1803–1870). In 1847 Maria married C.A. Rosetti. Besides the political activities together with her husband, Maria was one of the first journalist women in Romania. She was also involved in numerous philanthropic and social activities. In spite of her foreign origin, Maria Rosetti was a true Romanian patriot, and - through Rosenthal's paintings - became a symbol of the Romanian Revolution of 1848. Painting "Romania Casting Off Her Handcuffs on the Liberty Field" (or "Breaking Her Handcuffs") dates from 1849. Romania is represented wrapped in a tricolor flag, with a laurel branch in her left hand and with a flag in the right hand. Broken handcuffs are represented on the ground. Both paintings were given by the painter to C.A. Rosetti. Rosetti's testament gave the paintings to the Romanian State. Nowadays the paintings are hosted at the National Museum of Art of Romania (Muzeul Naţional de Artă al României).